We generally talk about the commuter bite—income earned in the District by non-residents, which the District cannot tax—but rarely about the District residents who work in the suburbs and pay income taxes in the District. Let us call them reverse commuters. Reverse commuters were thought to be residents who cannot find work in the District and therefore go to the suburbs, especially Maryland, to work jobs in retail, construction, or building and grounds maintenance. We have been seeing strong income growth among District residents, while job growth and wage growth in the District has been stagnant. This made us suspect that the nature of reverse commuters is changing. A quarter of the District residents who are employed work in the suburbs. This share has been relatively stable, varying between 24 percent and 27 percent since 2000. Personal earnings of reverse commuters have been increasing. 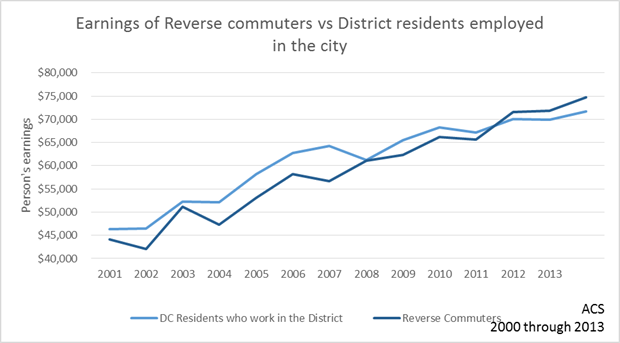 Until 2011, reverse commuters earned less than District residents with jobs in the District. Since 2011, reverse commuters, on average, earn more. This change would have come earlier had it not been for the federal stimulus after the great recession, and the consequent ramp up in federal hiring between 2009 and 2011. Personal earnings of reverse commuters is higher because they now hold higher paying jobs. 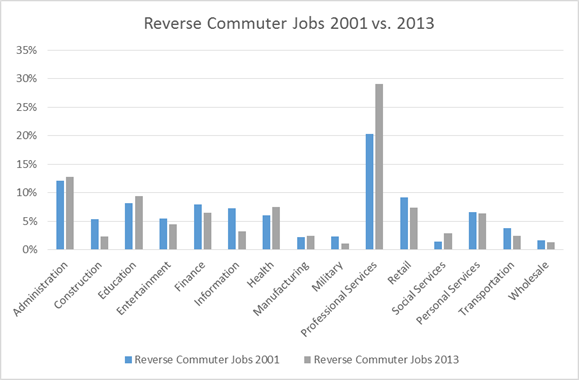 In 2001, only one in five reverse commuters held jobs in the professional and business services area. In 2013, this share was almost one in three. The growth is coming from higher paying jobs in professional services such as lawyers, managers, scientists, or architects and not from lower paying jobs in business services such as buildings maintenance, travel agencies, or administrative support. 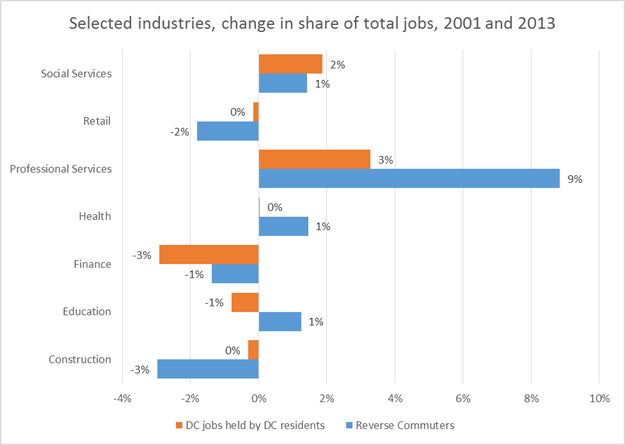 A smaller share of reverse commuters work in retail, construction, and health sector jobs in Maryland or Virginia while the share of such jobs held in the District by D.C. residents did not change since 2001. Finance sector jobs declined everywhere, but even more so in the District, suggesting that some of the reverse commuters successfully held on to such jobs in the suburbs. What exactly is this data? 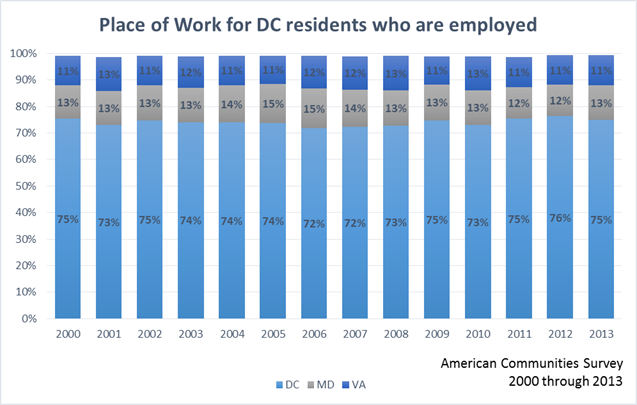 We used data from American Communities Survey between 2000 and 2001, looking at the place of work and personal earnings of DC residents who are employed. We focused on jobs in DC, MD, and VA. Some DC residents hold jobs in other states but it is not easy to make a reliable estimate about them. Their size in the sample is too small. We also looked at the industries DC residents hold jobs in, again focusing on DC, MD and VA. Detailed breakdowns of jobs are, once again, not reliable, given the small sample size. So we reported on broader industry areas, sticking to what we think are reliable estimates. Last week we looked at the types of families living in different neighborhoods in 2013. Today we see how the mix of families in neighborhoods has changed since 2002. 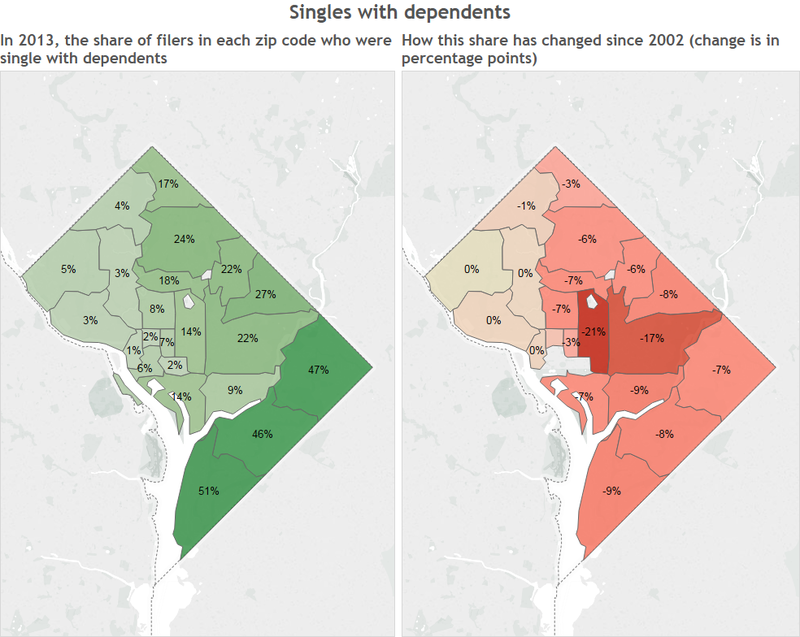 The maps below show that in neighborhoods east of Rock Creek Park, childless singles became a larger share of tax filers while singles with dependents shrank compared to other family types. The biggest changes happened in neighborhoods close to the eastern end of downtown, like Shaw, Bloomingdale, Chinatown, NoMa, and H Street. In these neighborhoods the share of childless singles rose by double-digits and the portion of households consisting of singles with dependents decreased by double-digits. We see a different story in neighborhoods west of Rock Creek Park. 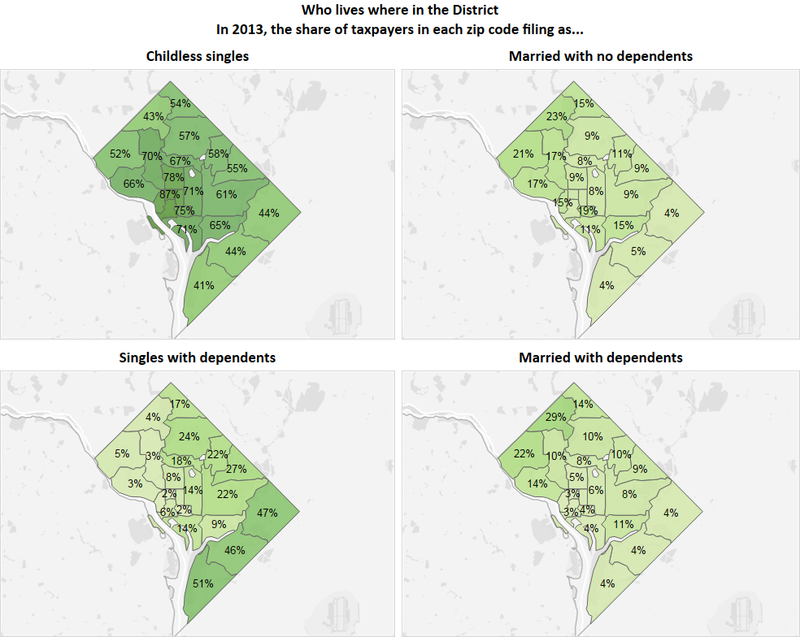 There, the share of taxpayers who were childless singles remained about the same, and even decreased in the far western corner of the District (which includes neighborhoods like AU Park, Spring Valley, Tenleytown, and Cathedral Heights). Meanwhile, there were no significant changes in the share of singles with dependents west of the park. How do married couples fit into this picture? People who were married with no dependents became a larger share of households in neighborhoods close to downtown, like Adams Morgan, U Street, Shaw, Logan Circle, and H Street. Married people with dependents became a larger share of households in neighborhoods adjacent to the eastern end of downtown–like Capitol Hill and H Street–as well as farther-out neighborhoods in Northwest, like Foxhall, Palisades, and Spring Valley. Some people might be surprised to see that neighborhoods like Petworth saw virtually no change in the share of taxpayers who were married with dependents. In fact, the number of married people with dependents around Petworth (zip 20011) did increase, but the share stayed about the same since so many more childless singles moved into the area. This is a lot of information to digest. To get a better sense of neighborhood-by-neighborhood changes, we created the tool below. It shows you the mix of families in different D.C. zip codes in 2002 and 2013. Click on the graph below to access the tool. What exactly is this data? We used data on people filing local income taxes in D.C. in 2001 and 2012. The addresses listed on this data will typically reflect where people lived in 2002 and 2013. “Childless singles” are people who filed as single and claimed no dependents. “Married with dependents” refers to people who filed as married on the same return and claimed dependents. “Married with no dependents” refers to people who filed as married on the same return and clamied no dependents. “Singles with dependents” are people who filed as heads of household and claimed dependents. We excluded all other types of filers (domestic partners, dependents filing taxes, people with dependents who file as single instead of head of household) from our analysis. Where is the vacant land in the District? Along with news on population growth and increasing housing prices, we often hear the concern that the small footprint of the city is an impediment to growth. The discussions on height limitations in the city, work done by the Urban Institute and by our good friends at the Office of Planning made us think: How much vacant land is there in the District that can one day be developed? We searched the District’s real property tax database for empty, unbuilt land. Of course, not all of this land is immediately buildable. Zoning and ownership factors greatly affect allowable development on these lands. And some of this land might never be buildable (Parks, rail tracks, other bits of land–do we want to see buildings in the Arboretum?). So think of this as an exercise over 300 years where population growth might make our current preferences less relevant. 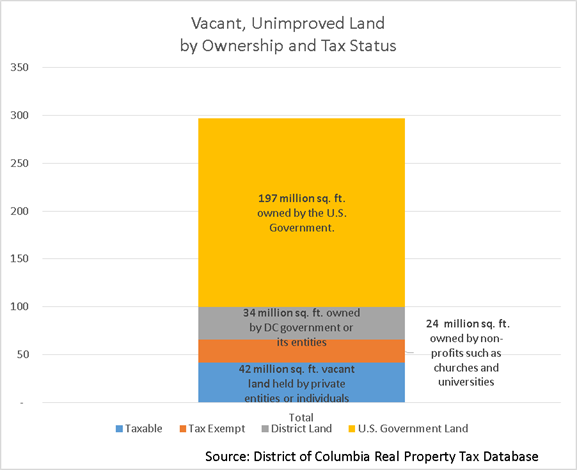 The District has approximately 300 million square feet of vacant, unimproved land. This accounts for about 19 percent of all land in the District’s real property tax database. Of this vacant land, only 14 percent (42 million square feet) is in the hands of private entities and individuals. These would be the simplest to build on (barring zoning limitations). Privately owned lots are concentrated in zip codes 20017 through 20020 and in 20002. Non-profit, non-taxable entities such as hospitals, universities, and churches own another 24 million square feet. Of course, we have seen many examples of such land being converted into mixed use. But, it takes a bit more time to get there. The District owns 34 million square feet, some by the District’s Housing Authority. These lands could be transformed into housing or mixed use, but the development must follow government procedures. It takes time. The United States government owns 197 million square feet of land (or 66 percent of the vacant and unimproved land). Of this, 133 million square feet are east of the river. In zip code 20032 (Washington Heights and Bellevue neighborhoods) only, the District and the U.S. governments combined hold 53 million square feet of land. What does this all mean? The Office of Planning estimates, under plausible conditions, the District could add 175,000 new households by 2040. This would mean an increase in demand for over 200 million square feet of housing to house the new residents (see pages 27 and 28 here). Twenty five years is not a very long time, so if we limit our new construction to privately owned vacant land only, to meet the 200 million mark, we would have to see a floor-area-ratio of 4 or greater–that is the usable construction area is four times or grater than the size of the lot. This is pretty dense. But of course there are other sources of land including parking lots, older buildings or properties with underutilized capacity. Here is a map of all vacant land in the District by zip codes by ownership and tax status. We made interactive maps, too, which you can get to using the link here or clicking on the map below. What exactly is this data? The data captures all lots and squares marked as vacant in the District’s real property database classified as commercial or residential. We eliminated smaller lots unless they are in the same square and combined made 2500 sq. ft. of land or more. The zip code results might be influenced by where ownership records fall within large properties. It’s time for some cool maps. Over the next few weeks we’ll be posting on the interesting geographic patterns we see in our local income tax data. Today we’ll start with a map showing the types of families living in different neighborhoods. The map below shows that in 2013 (the most recent year for which we have data), childless singles dominated almost all neighborhoods. They made up especially large shares of taxpayers close to downtown, in places like Logan Circle, Shaw, U Street, Chinatown, and Dupont Circle. The only neighborhoods in which childless singles weren’t the dominant group were those east of the Anacostia River. There, singles with dependents (known as heads of household for tax purposes), were the most common family type. Singles with dependents made up larger shares of neighborhoods east of Rock Creek Park than those west of the park, with the exception of some neighborhoods in the heart of downtown. 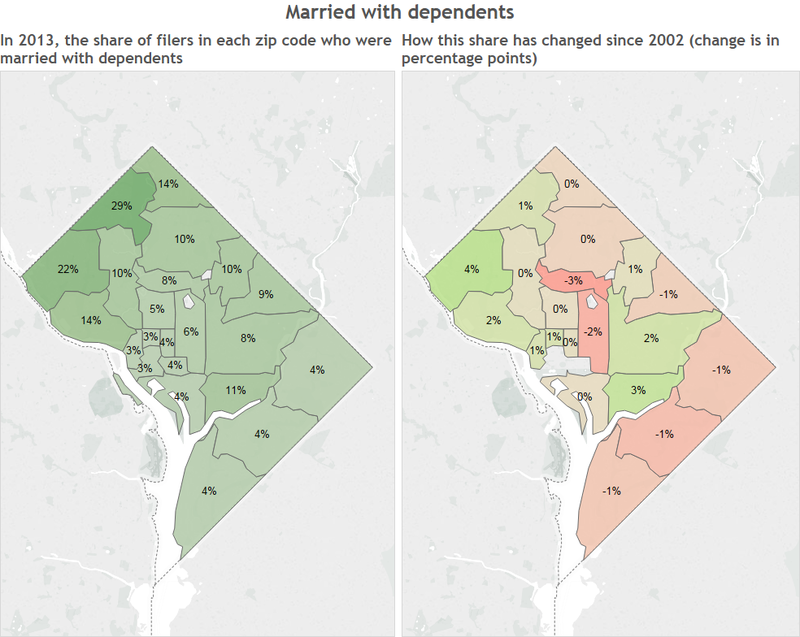 Married people—both with and without dependents—were most common in upper Northwest neighborhoods like AU Park, Spring Valley, and Friendship Heights. For our analysis we excluded certain types of filers, like domestic partners and people filing as dependents, to get a clearer picture of what’s happening with more common family configurations. More details on methodology are below the map. In an upcoming post we’ll look at how the types of families have shifted within the city since 2002. What exactly is this data? For our analysis we excluded all filers outside of the groups in the map. “Single with dependents” refers to people filing taxes as a head of household with dependents. “Childless singles” refers to people filing as single with no dependents. “Married” refers to people filing as married on the same tax return. 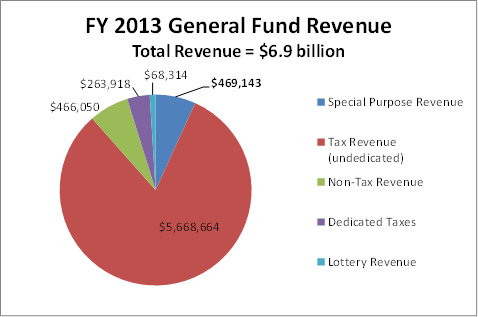 We used data from 2012 tax returns. Because people list on their tax forms the address from which they’re filing, we believe most of the addresses on 2012 tax year forms would reflect where people were living in 2013. Census data released in December shows that the District’s population stood at 658,893 as of June 2014 with 9,782 new residents compared to a year before. This makes 2014 the ninth straight year with population growth, during which time the city added nearly 92,000 residents. 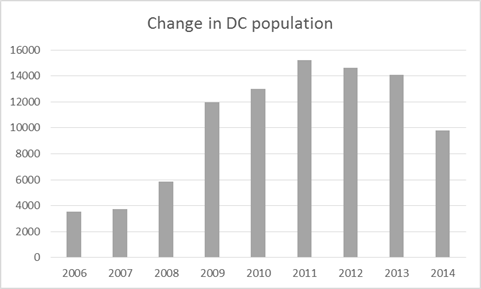 The District’s population is now the largest it has been since 1978. The slowdown in growth is largely due to a decline in domestic in-migration. Between 2013 and 2014, net domestic in-migration was just 1,173, down 5,267 (-82%) from the annual average (6,440) of the prior three years. 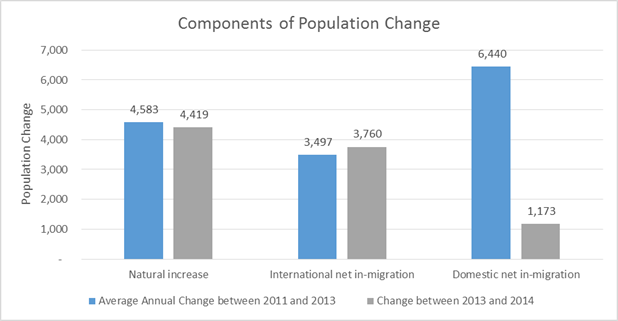 The other principal components of population change—natural increase and net international migration—increased in 2014 by approximately the same amounts as the annual average of the prior three years. We cannot tell from the Census data why in-migration is declining. Is it because more people are leaving the city? Fewer are moving in? Learning more about what people consider in their decisions to move or stay in a city is important for understanding how the city may change over the next few years. Even with the slower overall growth in 2014, however, the District continues to grow much faster than the rest of the nation. In 2014, the population grew by 1.5 percent-twice the population growth rate in the U.S. in general. See the January 2015 trend report for the full analysis and many interesting data on revenue and economic trends. Withholding grew by 5 percent in 2014 and by 8 percent on average in the last four years. 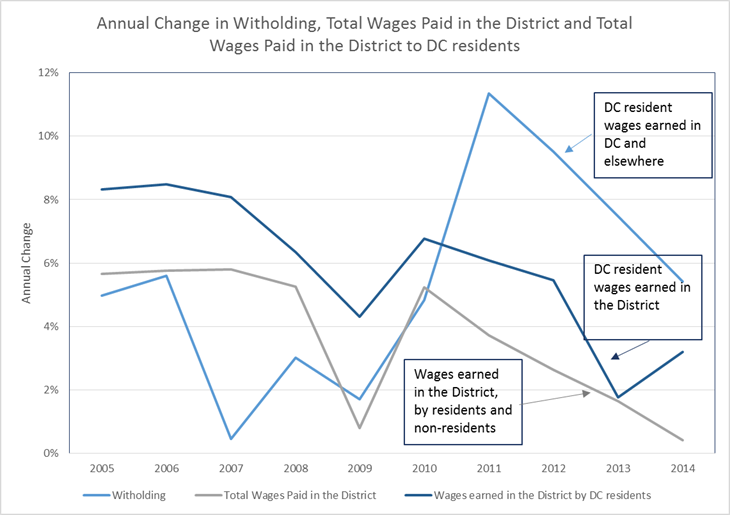 In contrast, total wages paid in the District to all workers (D.C. residents or not) grew by an average of 2 percent in the last four years, and did not grow at all in 2014. The wages earned by the District residents in the District did slightly better, averaging 4 percent in the last four years, but this is still lower than withholding growth. The answer is, once again, in the demographic change. In early 1990s, when the nation emerged from the 1991-92 recession rather quickly, the District economy continued worsen: first, residents were still leaving the city and the District’s population continued to decline through 1998. Second, the federally engineered recession that lasted through late 1990s drew businesses away. As a result, the District’s finances continued to worsen even though the general economic climate was improving across the region. The trend is now the opposite. District residents’ wage and salary earnings remain robust even though the average wages paid in the city is declining. 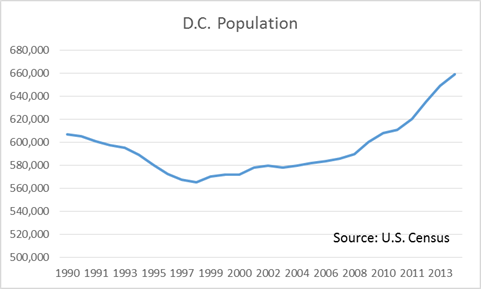 This is because more DC residents now work outside the District (especially in Maryland and Virginia) and more DC residents occupy the jobs in the District, reducing the commuter bite out of the income earned in the District. Thus, rather than flocking the suburbs to commute to the jobs in the District, more people are choosing to live in the District, commuting to jobs in Virginia and Maryland.